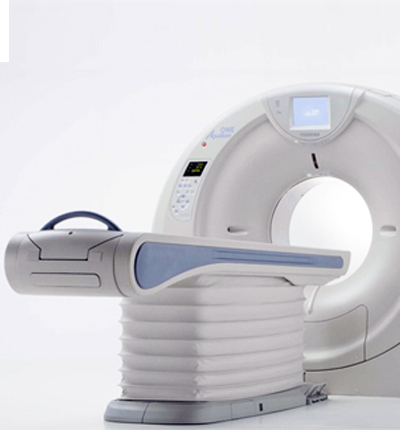 Most modern hospitals currently use spiral CT scanners. Helical (or spiral) cone beam computed tomography is a type of three dimensional computed tomography (CT) in which the source (usually of x-rays) describes a helical trajectory relative to the object while a two dimensional array of detectors measures the transmitted radiation on part of a cone of rays emanating from the source. In practical helical cone beam x-ray CT machines, the source and array of detectors are mounted on a rotating gantry while the patient is moved axially at a uniform rate. Earlier x-ray CT scanners imaged one slice at a time by rotating source and one dimensional array of detectors while the patient remained static. The helical scan method reduces the x-ray dose to the patient required for a given resolution while scanning more quickly. This is however at the cost of greater mathematical complexity in the reconstruction of the image from the measurements.